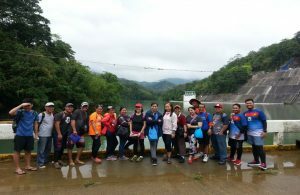 The University of the Philippines National Engineering Center (UP NEC) conducted its first Corporate Social Responsibility (CSR) for 2018 at the Ipo Dam and Watershed in Norzagaray, Bulacan last 11 June 2018. The activity was held in partnership with the UP Mountaineers. 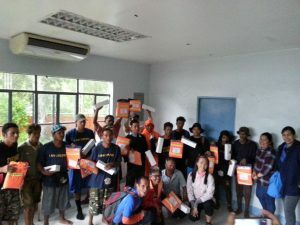 Dumagat forest rangers receiving donations from UP NEC. The program included dialogues with the Dumagat forest rangers, seed planting and tree nurturing, and donation-drive. During the dialogues, Mr. Fredd Ochavo of the UP Mountaineers instilled the crucial role of the Ipo Dam and Watershed to Metro Manila’s water supply. He also explained the different issues and challenges faced by the Ipo Dam such as continuous deforestations, erosions, illegal settling, and lack of institutional support among concerned government agencies. Dumagat forest rangers shared their love for nature and commitment for its preservation and protection. They also stressed their need for support most especially in terms of just and on-time release of remuneration. UP NEC posed for a group photo before leaving Ipo Dam and Watershed. UP NEC Executive Director Dr. Rizalinda L. de Leon expressed her gratitude to the UP Mountaineers and Dumagat forest rangers for their valuable contributions to the protection of Ipo. Dr. de Leon hoped that the CSR will serve as the beginning of countless undertakings.